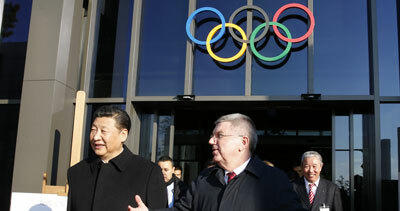 18th January, Lausanne: IOC President, Thomas Bach welcomed Chinese President, Xi Jinping to the Olympic Museum today, in what is the first visit by a Chinese Head of State to the IOC. In a bilateral meeting, the two leaders highlighted the close cooperation between the IOC and China with regard to the organisation of the Olympic Winter Games Beijing 2022. President Xi expressed his personal commitment to make these Games a success. They also discussed how the already strong ties can be strengthened in the future and how to promote the role of sport in society. Sitting at the original desk belonging to the founder of the Olympic Movement, Pierre de Coubertin, President Xi signed the IOC's visitors' book to commemorate his historic visit to the Olympic Capital. "China and the IOC enjoy excellent relations and strong cooperation on many different levels. The historic visit of President Xi Jinping to the IOC is another expression of this great cooperation and our friendship with the Chinese people," said President Bach. "This is an excellent foundation to write history once more, with Beijing set to become the first city in the world to host both the summer and winter editions of the Olympic Games." In his remarks, President Xi highlighted the important role of sport in China, saying that sport is an integral part of the country's national development plan: "Over the years, the IOC and President Bach have made important contributions to support the healthy development not only of the Olympic Movement but also the development of sport in China. I would like to express my appreciation for what you have done." He went on to say: "We have many dreams, the Chinese dream of turning China into a society of prosperity; the dream of promoting the Olympic Movement; and also the dream of fostering a community of shared destiny for the whole of humanity. All the dreams are interconnected and integrated with one another. In this respect, I believe the IOC has a huge role to play to help the fulfilment of all these dreams." 16th Dec: Big payday for Latvian. 9th Dec: Gold for Denmark and USA. 30th Oct: Daegu, Paranaque bags Masters gold. 24th Oct: Malaysia, Singapore wins last leg. 23rd Oct: Malaysia sweeps Masters titles. 12th Oct: China celebrates sweet double. 12th Oct: Deserving victory for top seeds. 28th Sep: Second seeds captures Masters gold. 12th Aug: Swede wins fifth PBA title. 2nd Aug: Malaysia wins first gold. 18th Jul: First back-to-back tour title. 17th Jul: Indonesian, Malaysian bags titles. 10th Jul: First double titles for Hong Kong. 9th Jul: Hong Kong, Chinese Taipei shares glory. 27th Jun: Maiden victory for Japan and Korea. 26th Jun: Top seeds win Open Masters titles. 18th Apr: Third tour title for Aussie. 17th Apr: Grand double for Thailand. 9th Mar: Historical win for Bahraini youth. 2nd Mar: American cruises to an easy victory. 13th Dec: Korea emerges as overall champion. 8th Dec: Third tour title for Indonesian. 7th Dec: Debutant emerges as champion. 2nd Dec: Victory in third attempt. 19th Nov: Historical win for Hong Kong. 26th Oct: Indonesians celebrate grand double. 25th Oct: Topseeds win Masters titles. 31st Aug: Aussie, Malaysia bags tour titles. 30th Aug: Korea sweeps Masters titles. 31st Jul: Singapore, Korea wins Masters gold. 23rd Jun: Victory for Hong Kong and Macau. 22nd Jun: Top seeds win Open Masters titles. 14th Jun: Thai, Singaporean wins Masters gold. 1st May: Convincing victory for Kuwaiti. 30th Apr: Dane, Egyptian emerge as champions. 17th Apr: Thailand, Macau clinches titles. 16th Apr: Malaysians sweep Masters titles. 31st Mar: Malaysia sweeps Masters gold. 17th Mar: Victory for Bahraini and Hong Kong. 15th Mar: Indonesian Asian champion triumphs. 14th Mar: American top seed bags title.